Abiodun Ogunjobi popularly called Abbey Godogodo who claims he has been robbing for over 14 years was caught in his mansion in Ibadan after policemen laid ambush for him for close to 3 weeks. 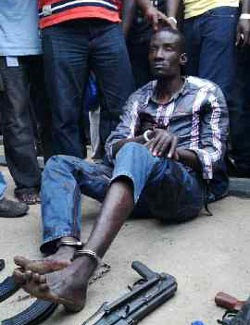 The 36-year-old notorious armed robbery gang leader confessed he has killed several policemen during his operations. He said he has no regret killing them because it’s a form of revenge for killing his boys. I started robbing in 1996. I have spent more than seven years in prison. My prolonged stay in prison for a minor crime of fighting hardened me and I vowed to pay back the police for that injustice. “After I was released, I went to Katangua, in Iyana-Ipaja area of Lagos to meet my friend, Odun, who was arrested by the police recently at O4 Hotel in Ajah. Odun was an armed robber then and we started operating. “We worked with several other gangs and I invested the loots in purchasing arms. I have built five houses in Ifo, Ilaro, Ikorodu and Ibadan. “I usually kill policemen and take their rifles because policemen have killed several of my boys and taken most of our rifles from them. “I have no regrets for all I have done and I have no advice for young people who want to become armed robbers like me. Abbey Godogodo was behind the brutal murder of several people at Q4 hotel in Ajah, Lagos on the 7th of July 2013. His boys killed Mr Olanrewaju Subair, the hotel owner. They also killed the security guards working at a popular hotel along Apapa Road in Ebute Metta on the same day. Every day 4 d theif one day 4 d owner. If this idoit cliams he has some scores to settle with the police,. Then why is he robbing poor inocent Nigerians who no nothing about his past, Men he deserves to die with so called friends. This suspect should be taking to court to defend his self. No jungle justice. Dis life is ful of war. “My prolong stay in prison for minor crime of fighting” Let look at Abbey Godogodo words, it is very wrong for taking law into your hand for deciding to choose crime than obeying law. Again, I think it is another thing for some to stay longer than sentence period in custody or prison. Basically, law is suppose to protect people from injustice. Abbey should have seek better way of getting justice and be compensate than taking law into is hand. It is a pity justice in our country is not properly execute. “My prolong stay in prison for minor crime of fighting” Nigerian! Injustice! Although NPF might be working hard to protect the nation but still there is skeleton in their cupboard always. Although they are employed to settle dispute and enforce laws among citizens. Had it been that NPF had cut the long nails with proper justice earlier this wouldn’t have happened to this man. But still Abbey Godogodo, you’ve eaten more than you earn although initially to me you are not guilty but now you got no option left and everything in life has its opposite while Death is the reward of Sin. The NPF also have to be blame for this because, they ruined this man life by not treading on the right path at first.